Is it a yam? Or a sweet potato? Well, it seems I’ve been telling the wrong story on the tuber front. I’ve finally done my research and I can now walk the tuber talk with confidence, head held high. Like a good whodunnit?, this whatisit? was a food mystery waiting to be solved in my head space. I now feel lighter, less burdened, and well…kind of tuber-cocky. Conventional grocery stores typically label two specific root vegetables as either sweet potato or yam. What we see in the produce bins are light-skinned, white-fleshed darlings alongside darker-skinned, orange-fleshed versions. One is dubbed sweet potato and the other is marked yam. Depending on the store, these terms are confusingly interchangeable. They are probably all sweet potatoes! You see, sweet potatoes and yams are two very different plants. 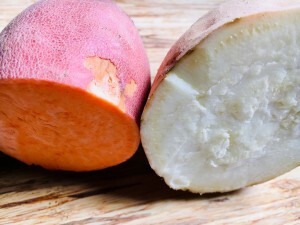 Yams are tubers that belong to the plant family of lilies and grasses, and are grown in tropical climes – like Africa, Southeast Asia, the Caribbean, and Central America. They are cylindrical in shape, with rough, dark, hairy outer skin, and an off-white, purple or red flesh that’s starchy and dry. They are less typically found in our conventional grocery stores. Sweet potatoes, on the other hand, are commonly grown in North America and belong to the morning glory plant family. There are two usual suspects found in our veggie bins: the firm version (golden skin, pale flesh) and the softer sibling (copper skin, orange flesh). Both are sweeter and moister than yams, and they present as elongated spud-like roots with ends that taper to a point. These two versions are rarely both labelled as sweet potatoes – which they are. Rather, one is classed as sweet potato and one as yam. Yesterday, I whipped up this delicious side dish. Initially, I thought I was using both sweet potatoes and yams in my recipe, but now realized that I used two versions of the sweet potato. Regardless of name, this simple dish is an Uber-Tuber Dinner Winner. Peel and chop sweet potatoes into chunks and steam (or boil) until soft. Place in bowl and add remaining ingredients; use hand masher to bring to creamy consistency. Dollop into serving dish. 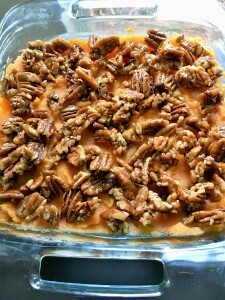 While sweet potatoes are steaming, place pecans and other topping ingredients in pan and saute until liquid disappears, about 3 minutes. Stir constantly. Place on parchment and separate nuts as they will otherwise settle into big sticky clumps. Adorn your pile of mash with these sweet and salty jewels! One medium sweet potato (especially the orange-flesher) teems with vitamin A. Vitamin A stimulates the production of immune cells to fight disease and infection and is a boon to maintaining healthy vision. Vitamin C plays a great supportive role in immune-boosting and a wee pop of potassium rounds this tuber-liciousness out. The fiber content is exceptional, too – helping to regulate blood sugar.